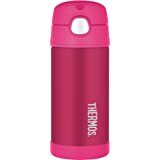 Thermos THERMOcafe Slimline Vacuum Insulated Flask has double wall vacuum insulation that locks in temperature to preserve flavour and freshness. It has durable stainless steel interior and exterior. The convenient twist and pour stopper make serving simple. Perfect for when on-the-go. Capacity: 500ml.